The Middle East woke up to alarm this morning, as the government of Turkey announced that the Syrian town of Kobane was on the verge of falling to Islamic State fighters. The US Air Force showed up to back up Kurdish defenders in response, and one guy was on the ground to livetweet the whole thing. Ever since the US and its allies began strikes in Syria roughly two weeks ago, IS has been adapting its tactics to try and evade the punishing pounding of bombs and missiles raining atop their maniacal heads. Changing up tactics is not entirely effective, however, when you're going up against a supersonic, swing-wing, semi-stealthy B-1B bomber. 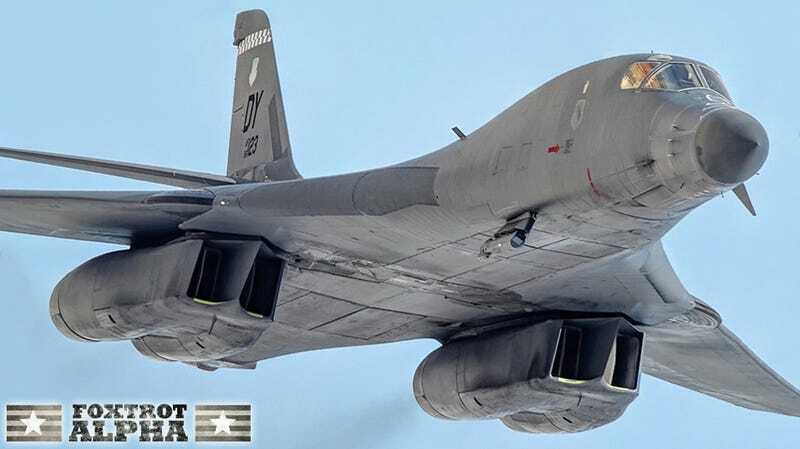 With its ability to loiter over the battlefield for hours at a time, carry 125,000 pounds of payload, and shoot up to speeds over Mach 1, the B-1B Lancer, also known as the "Bone," can be an insurgent's worst nightmare. And when it's equipped with a Sniper Advanced Targeting Pod, as this one likely was, it can be deadly accurate. But that doesn't mean the situation on the ground isn't incredibly fluid, incredibly dangerous, and incredibly scary. At various points, it's unclear who is fighting who, as the Kurdish militia, the Turkish military, and the IS fighters all slug it out. Twitter user @cahitstorm managed to tweet much of the day's fighting, all while hiding in a pepper field. It starts off slow, with IS on the advantage, but once the bomber shows up things get very heavy, very fast. And things do not go well for the Islamic State. And then the airborne artillery showed up. Let this be a reminder. The conflict in Syria and Iraq is not some abstract concept thousands of miles away. It's real, it involves real people, and real lives are under threat.